Assassins, Templars, the Animus, Abstergo Industries, and the power of “free will”. Yes, I’m talking about Assassin’s Creed. Created by video game company Ubisoft, Assassin’s Creed first debuted back in 2007 on the major consoles at the time (PS3, Xbox 360, and PC), presenting the idea of structuring a video game narrative of two halves, placing one story in the present day (circa 2012) as the character of Desmond Miles and the other story in the past during the Third Crusade (1189-1192) as the character Altaïr Ibn-La’Ahad (Desmond’s Assassin ancestor). The game praised for its narrative as well as its gameplay as players (as Altaïr) would be able to freely move around the backdrop setting of Crusades (Jerusalem, Acre, and Damascus) to complete objectives and find clues. Following the first game (named Assassin’s Creed), many other video games followed, chronicling the further adventures of the Assassins and the Templars throughout various time periods in history (i.e. New York 1758, the 18th century Caribbean, the 15th century Florence, etc.). As the game’s progressed, the overarching story expanded and became more intricate in discovering the timeless battle to find the elusive “pieces of Eden” (powerful and ancient relics) from the two warring groups (The Assassins and the Templars. Now, Ubisoft, 20th Century Fox studios, and director Justin Kurzel, brings the video game world of Assassin’s Creed to the big screen in the movie that’s appropriately titled Assassin’s Creed. Does this video game to film adaption succeed where other have failed or does miss its mark entirely? On death row for murder, Callum Lynch (Michael Fassbender) is taken from the brink of death of death and mysteriously relocated to a high-tech and fortified fortress in Spain, under the orders for the Abstergo Corporation. Placed here as a test subject, Callum, plucked from his execution by top scientist Sophia Rikkin (Marion Cotillard), is part of a long lineage of Assassins, an ancient brotherhood devoted to preserving peace through free will, with his DNA capable of providing a direct link to his ancestor. Hooked into the machine known as the Animus, Callum’s experiences a shocking revelation, reliving the moments of top Assassin ancestor Aguilar de Nerha (also played by Michael Fassbender) in 1492 Spain, during the height of the Spanish Inquisition. 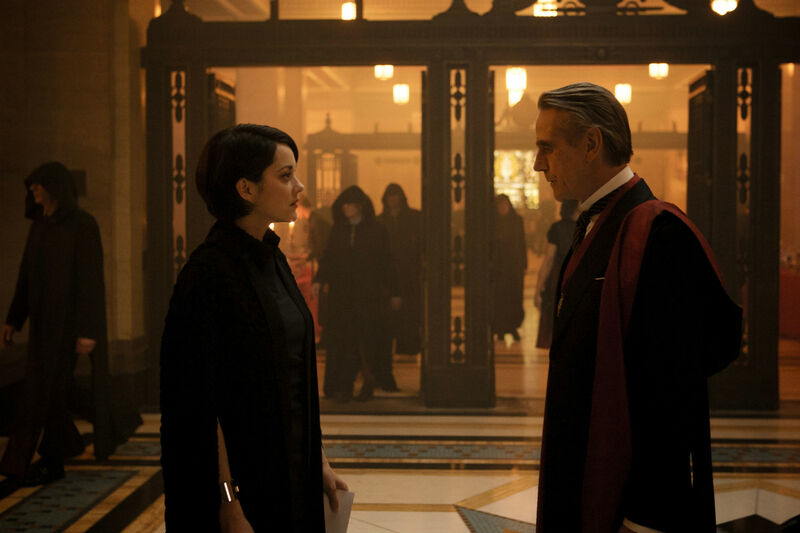 In the past, Aguilar, who is joined by fellow Assassin Maria (Ariane Labed), is tasked with protecting the fabled Apple of Eden, the key to human behavior and of free will, from their rival order, the Templars. Excited by Callum’s progress in the Animus and learning more about Aguilar, inching ever closer to where the hidden Apple of Eden is located (in present day), Sophia answers to her father, Alan Rikkin (Jeremy Irons), a powerful figure who supports his daughters’ efforts to eradicate violence once and for all, but feels pressure from the Elders to produce results from Sophia’s Animus project. However, the deeper they got into Callum’s memory of Aguilar, the deeper Callum realizes his true potential. While I do like video games and do like long running video game series (The Legend of Zelda, Final Fantasy, and Call of Duty), I’ve only played a bit of the first Assassin’s Creed game. I’d played around in it for like the first couple of hours, but never could grasp the concept. Thus, sadly I didn’t purchase any of the other Assassin games. However, I was intrigued by its story and the video game’s mythos, so I read up on the series (via on the internet) and do know the main gist of the narrative of Assassins Creed (i.e. the Isu, Minerva, Desmond, Ezio, etc.). This, of course, brings me to the movie Assassin’s Creed. Given its plethora of lore / mythology in history and its intricate storyline narrative (from what I heard on the internet), making an Assassin’s Creed movie would be a very interesting and entertaining movie. The movie’s trailers, however, did not impress me much due to the usage of the Kanye West songs (which honestly didn’t fit the trailer). That being said, I was still curious to see Assassin’s Creed and to see if it had potential to make the jump (properly) from video game to big screen. Unfortunately, after seeing the movie, I felt that infamous “leap of faith” jump from game to screen was not met, for Assassin’s Creed, while a step in the right direction for “video game” movies and visually stunning, falters with characterization in a hollow-cut story. Assassin’s Creed is directed by Justin Kurzel, who’s previous work includes directing the films The Snowtown Murders and the 2015 version of Macbeth, which featured Michael Fassbender and Marion Cotillard. One of the most notable changes many fans of the games will notice is that Kurzel doesn’t create a direct carbon copy of the first game with Assassin’s Creed, choosing to create a somewhat original story that very much in the spirit and rooted in the game’s nuances. Naturally, many fans of the Creed games will notice the similarities (most notably that Callum lynch is a somewhat mirror image to video game character Desmond Miles), but it’s a way for Kurzel’s film to stand on its alone as a separate component to Assassin’s Creed brand name. This separation / reimagine the video game source material also means to update certain such as the narrative’s mythos in using the 14th Century Spanish Inquisition as the film’s backdrop setting (a setting that hasn’t been used in the video games) as well as reimaging the Animus, removing the chair like configuration from the video games and replacing it with a stylish high-tech mechanical arm that seems to blend in “interactive” as Fassbender’s Callum mimics (mirrors) the memories he has of his ancestor when he’s hooked up into it, which creates some dynamics scenes as Kurzel (sometimes) shifts between Callum and Aguilar during these sequences. Where the movie truly shines (brilliantly and visually) is in the “past” scenes during the 14th Century Spanish Inquisition with Aguilar and the other Assassins. Take many cues and thrills from the games, these scenes are definitely great, seeing Aguilar and fellow Assassin Maria jump off rooftops, leaping off church spires, and engaging with Templar enemies with fierce ferocity. It’s truly a highlight of the movie. In terms of filmmaking, Assassin’s Creed is very stylish and visually appealing, something I didn’t really expect from a video game movie. From costume designs, to set layouts, to cinematography camera angles, and to the film’s score (composed by Kurzel’s brother Jed Kurzel), Assassin’s Creed is beautifully rendered movie. As one could imagine, video game film adaptations haven’t had the best track record in success, for fail in their undertaking, often coming off as cheesy, hokey, and don’t translate well from video game console to the silver screen. So, regardless of what you may ultimately think of this movie, Kurzel does make a sincere gesture in presenting Assassin’s Creed in a more accessible way, a step in the direction for video game movies. While I do say that the movie is a step in the right direction (for video game movies), Assassin’s Creed (as its own motion picture entity) falters in numerous place that make the feature fall out of reach of its aspiring cinematic goals. I definitely could feel that Kurzel is trying to serve too many masters in the movie from its video game fans, creative direction (as a feature film), and to causaul moviegoers Though I’ve said I’ve never played much of the games before, I assume many fans out there get excited about the “past” narrative where the character of the game goes into the animus and you (the player) play as the character’s ancestor. The same could be said about this movie as we get see Callum relive the memories of his 14th Century ancestor Aguilar. Unfortunately, the time spent in the past scenes with Aguilar are few and far between. When the story flips back to the present day (with Callum, Sophia, and the rest of the characters), the movie becomes less interesting and boring. You basically wish for more time in Aguilar’s past rather present day Callum. The film’s script, penned by Michael Lesslie, Adam Cooper, and Bill Collage, is also a weak point for the film as some of it is messy (making the narrative a convoluted at times) and some of the dialogue seems clunky. In addition, since all the Creed games are woven intricately and are layered in historical events, one would expect to see Assassin’s Creed “oozing” with history references and myth lore, especially with the during the Spanish Inquisition (an area of which the video games haven’t explored…yet) and in the mythos of the Templars (a secular group that many have been fascinated with in various media outlets via books, TV, and movies). However, that’s not the case in the actual film as very little historical points are presented, with not enough ties “to the past” to get history buffs engage in the story’s premise. Then there’s too many characters and not enough time for each one to fully developed (more on that below). Lastly, the film’s third act becomes a bit boring and a bit mundane. One who expect to see a climactic battle ensue that’s something worth of a video game film. Unfortunately, we don’t get that as it actually feels the opposite, reducing the film’s hero (Callum) into a silent and flat character and with Kurzel ending the film on cliffhanger / sequel notion rather than a proper and satisfying conclusion. I actually started to fall asleep a bit at the beginning of the movie’s third act (and that’s not a good thing). In short, what could’ve been something truly great for this video game film adaption is marred by its uninspiring hero’s journey and lack of focus in the movie’s written and ultimate direction. The cast in Assassin’s Creed is a well-liked / recognizable one, but some performances are better than others, a direct result of the film’s clumsy script or not enough devoted time to their character. Acting as the hero protagonist in the movie is actor Michael Fassbender, who plays both Callum Lynch / Aguilar. Fassbender, known for his roles in Steve Jobs, Macbeth, and some of the recent X-Men movies, plays Callum as one would expect as an individual who is being thrust into an extremely situation / circumstance and has to slowly come to grips with his current situation. Unfortunately, during the film’s third act, Fassbender’s Callum becomes less interesting, feeling more like a hollowed character and (ultimately) becomes a bit flat. Though, Fassbender is fully committed to the role of Callum. On the flip side, Fassbender excels as the Assassin Aguilar and some of the best scenes in the movie are when he’s present on-screen. So, if I had to choose which Fassbender character I would’ve liked to seeing more of in Assassin’s Creed, I would definitely say Aguilar. Behind Fassbender (in terms of screen-time), is actress Marion Cotillard, who plays the Animus Project director Sophia Rikkin. Like Fassbender, Cotillard commits to the role, but plays the somewhat “common” role she used to playing (aka the mysterious character). In truth, Sophia is a bit fleshed-out more than some of the other minor characters, but can’t escape from being a device for the film’s world building in expositional scenes. The rest of the movie’s supporting players, unfortunately, suffers from lack of characterization, which (as I said above) is in conjunction with film’s script, despite some being played by well-known actors. Actress Ariane Labed as Maria, an Assassin who fights alongside Aguilar. Believe or not, Labed’s Maria is quite awesome and quite a scene-stealer whenever she’s on-screen. However, she gets more pushed aside as the movie progresses, which is a shame as I would’ve liked to seem more of her in the movie. Actor Jeremy Irons plays Sophia’s father Alan Rikkin, the CEO of Abstergo Corporation. Like actor Morgan Freeman, Irons has an impressive and distinct voice and does bring a sense of gravitas to the feature, but his character of Alan is a one-dimensional one, with Kurzel providing little to no character development for the role to evolve beyond what’s initial presented. The same can be said with actor Michael Kenneth Williams who plays Moussa, an individual who (like Callum) is a guest-prisoner for the Abstergo Corporation (to be used in the Animus). Williams is good actor (loved him in the HBO’s series The Wire and Boardwalk Empire), but there’s really not much to the character of Moussa in this movie. He’s basically a footnote character. Other noteworthy minor characters include, Denis Menochet as McGowen (a head security personnel at Abstergo Corporation), Callum Tuner as Nathan (a character similar to Moussa), and Brendan Gleeson as Callum’s father Joseph Lynch In short, Assassin’s Creed has a good selection of its cast, which all perform well (no overacting or anything like that), but are just underdeveloped or never utilized to their character / actors fully potential. The secret to find the Apple of Eden lies in the past in the movie Assassin’s Creed. Director Justin Kurzel newest film adapts the popular video game series into feature length film, presenting a very strong (and appealing) concept that’s noteworthy and a step in the direction for future video game movies. However, the film falters with a clumsy script, convoluted story, and a lackluster finale, crippling the feature with its heightened goals and ambitions. To me, the movie was just okay and bit of a letdown at the same time. Echoing to what I said above, the film is ambitious and is in the right direction for video game adapted movies, but (as whole) the movie fails to fully ignite and engage its audience in its cinematic world of Assassins and Templars. Fans of the video games might give this movie paint this movie in a more favorable light than the average moviegoer, so I would say it’s a spilt between an iffy-choice and a rental. With the film left opened end, will there be an Assassin’s Creed 2 and the long staying battle between the two ancient orders. The answer to that question is just as elusive as what arcane knowledge will the Apple of Eden unlock, a secret answer to we may never know. This is one of my biggest disappointments of 2016. I honestly have come to the point where I don’t think a video game adaptation can be made. If this group, with this material couldn’t do it….what’s going to succeed? I think the moment where a HALO movie would’ve been a success no matter what has passed, and I think they’re nuts for not having done it five years ago when it would’ve been automatic money.